UPDATE: On March 17, 2019, Gozal Bayramli was freed by presidential pardon. Gozal Bayramli is the Deputy Chairperson of Azerbaijani Popular Front Party. She has been one of the leaders of the opposition movement in Azerbaijan for more than a decade. 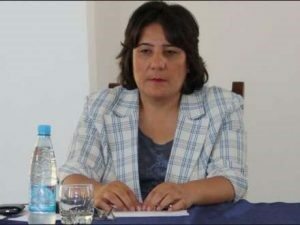 On May 25, 2017, she was detained by Azerbaijani authorities on the Georgia border while returning from Tbilisi where she was receiving medical treatment for serious health problems. She was then sentenced to pre-trial detention on charges that she smuggled €12,000 ($13,400) in cash. A few weeks before her imprisonment, the Azerbaijan government accused her, along with several activists based in Tbilisi, of attempting to overthrow the government of President Ilham Aliyev. Gozal’s imprisonment is part of a broader crackdown on the Azerbaijan National Front Party. Currently, three aides to the Chairperson, as well as numerous members of the party are in prison for politically-motivated charges. The US State Department stated that it was troubled by the arrest of Gozal Bayramli. Gozal was kept in a pre-trial detention facility while her case was waiting for the court review. On January 23, 2018 Gozal Bayramli was found guilty and sentenced to three years in prison.